This air flow meter is very economical. With this device you can measure wind speed and air temperature. Once you have entered the cross section, the air flow meter will determine the air flow. 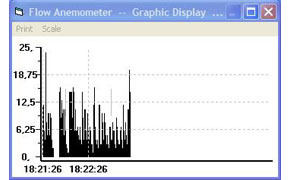 The readings can be stored in the device and then transferred to a computer for further analysis. As such, you can take a series of measurements with the air flow meter off-site and then analyse the data in the office. This way, you save time and maintain a high level of accuracy in readings. 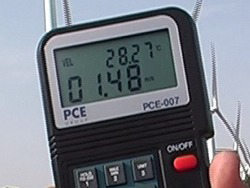 The external impeller, connected by 1.5 m long cable, increases the mobility and flexibility of measurements of wind speed. These air flow meters form a part of the basic equipment of an installation technician for ventilation systems. The life-span of the battery is approx. 50 hours with a current of 300 mA/h. If you wish to take timed measurements over a period of time longer than 2 days, you will need to use a battery pack or a power adaptor. This link gives a general overview of air flow meters (for example, multifunction air flow meter). 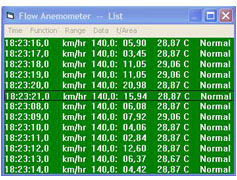 Yes, 2000 readings either as wind speed or temperature. Don't forget: if the memory is full, it will save all currently stored data, but if the batteries have no power, then all the data will be lost. 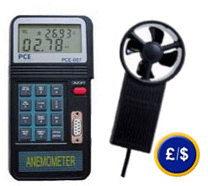 Anemometer: 0 to 50°C/<80% r.h.
Side wheel: 0 to 60°C/<80% r.h. 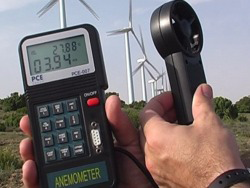 Measuring wind speed with the PCE-007 air flow meter and then checking the data on the large LCD.